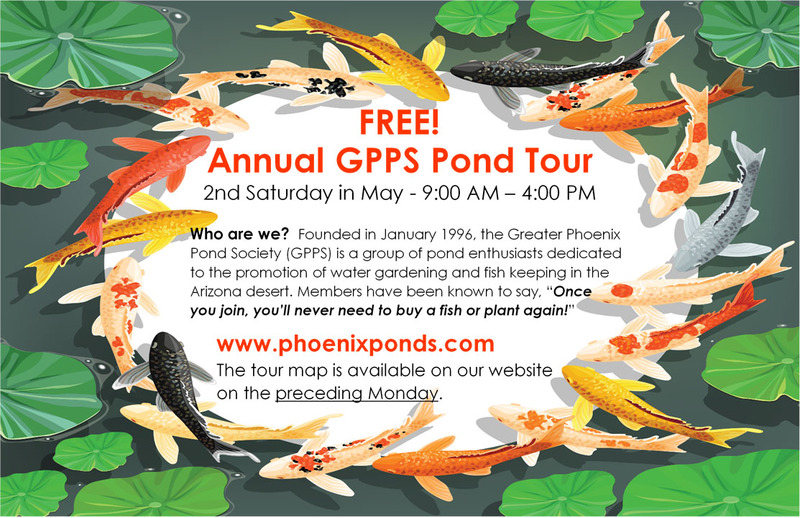 Greater Phoenix Pond Society, ponds, fish, watergardens, and plants home page! for information. for location assistance. Visitors are welcome! Size of Your Water Feature or Pond does NOT matter! Table Top to Lake, Pond(s) to Pondless -- any size of water feature, a desire to have one, or want to learn about them qualifies you for membership. May 11, 2019 is the next Pond Tour. from 9 am - 4 pm. Yearly membership dues are $25 per household. Dues may be handed to the President or treasurer at a club meeting. Adobe Reader is a free download from Adobe. The Adobe Reader is available for different operating systems, e.g., Mac, Solaris, Linex, etc. at this link. We had some phone calls from Macintosh users who are unable to open pdf files.